some strings pass in front of the plane and some behind, but it’s not likely any will intersect the plane-probe. As we consider probes that can be used to estimate length, we will think about isotropic orientation. In addition to isotropy, there are two other major factors that influence the choice of probe; whether you have thick sections or thin sections and whether or not you can keep track of the volume fraction (see fractionator principle) during the sectioning. As always use systematic random sampling. If you want to make an estimate of length in your region of interest, the best favor you can do for yourself is have thick sections and keep track of the volume fraction. This makes it possible for you to use the Spaceballs probe (Mouton, et al., 2002) (see Spaceballs, above) in its ‘fractionator’ form. Here the probe itself is isotropic; no matter the orientation of the strings, the surface of the sphere will always encounter them with the same number of intersections. Therefore you can use Spaceballs on preferentially oriented tissue; you don’t have to worry about randomly orienting your tissue. This formula is in a slightly different form than how it appeared in the original paper; the volume, ‘v’ was defined as the volume of a box that would fit around the isotropic sphere, therefore two more terms, called F2 and F3, were used (Mouton, et al., 2002, equation 2). For tissue sections that are less than around twenty microns in thickness, a hemisphere instead of a sphere may be used. Only intersections through the convex surface of the hemisphere are counted. The difference in the formula is that the surface area, ‘a’, is that of a hemisphere. 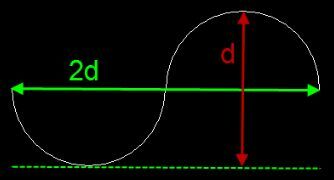 Any intersection, Qi, is counted as one-half if the string is penetrating the convex surface of the hemisphere at the level of the cut surface; otherwise we would be over-counting since a hemisphere ‘shares’ its surface with another possible hemisphere. “The isotropy requirement is rigorously complied even if a hemisphere is used instead of a complete sphere to count the intersections” (Mouton, et al., 2002, pg. 60, second column, sixth complete sentence). 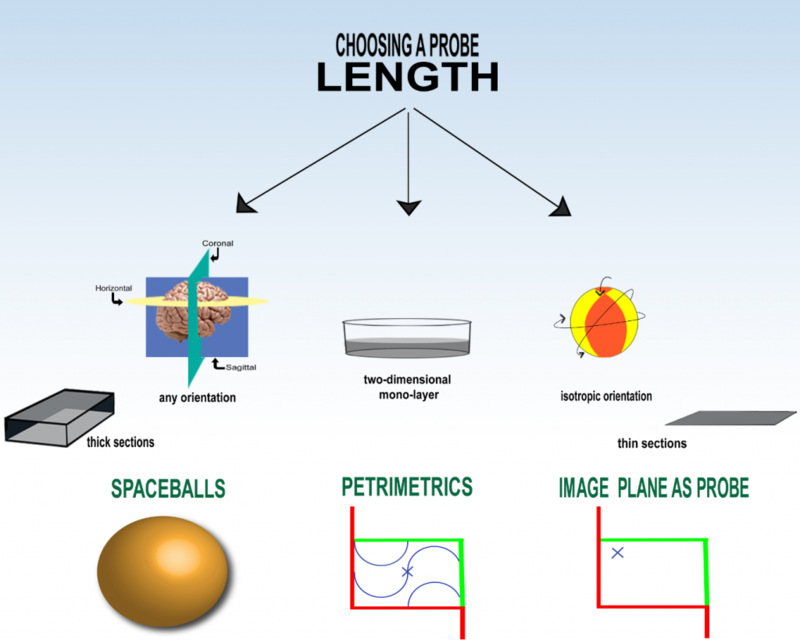 If you can’t avoid using thin sections, there is no probe for length for tissue that is not random in three planes. Therefore you have to use isotropic tissue. An isotropic section has all three dimensions randomized; the orientation of the tissue sectioning is random so you don’t have to worry about the probe being random. In this case you can use the image through the microscope or the photomicrograph as the plane that is the probe (see ‘image plane as probe’ above). Use random and systematic sampling, as you always should, and a counting frame, and the estimate of length per volume will be twice the intersection number that you count divided by the area. You can use a Fractionator sampling scheme to supply the counting frame and keep track of the intersections of the strings with the image-plane (for examples see Evans et al., 2004, section 3.3, p. 255 and Howard and Reed, 2010, p. 126). Spaceballs is at the top of the ‘length tree’ since it uses the fractionator method, can be used on tissue of any orientation, and has rules that are easy to follow (please see text for details). You could alternatively, use the Isotropic Virtual Planes probe (Larsen, et al., 1998) on thick, preferentially-oriented tissue. This, like Spaceballs, is a case where the probe is isotropic so you don’t have to worry about the orientation of the tissue. Spaceballs has the advantage, however, of being much easier to use. The L-cycloid optical fractionator probe (Stocks, et al., 1996) and the IUR planes optical fractionator probe (Howard and Reed, 2010, Chapter 7) are also used on thick tissue, but are not suitable for preferentially oriented tissue; the former calls for tissue that is random in two planes, vertical sections, and the latter for tissue that is random in three planes, isotropic sections. Another method you can use for length estimation is the Cycloids for Lv probe (Gokhale, 1989). Thick sections that are random in two planes are required, but you can use this probe without keeping track of the volume fraction. However it is always better to keep track of the volume fraction and extrapolate to get the estimate, so if at all possible, please use the Spaceballs probe. Gokhale, A.M. 1989 Unbiased estimation of curve length in 3-D using vertical slices. J. Microsc., 159, pp 133-141. Howard, C.V. and M.G. 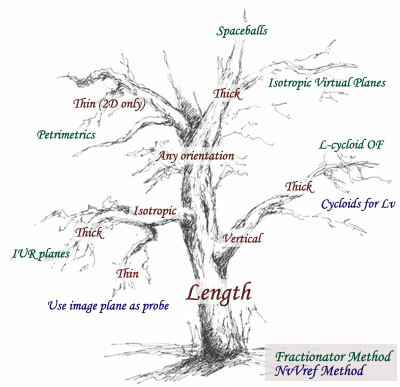 Reed, 2010, Unbiased Stereology, Second Edition QTP Publications, Liverpool, U.K.
Larsen JO, Gundersen HJ, Nielsen J., 1998 Global spatial sampling with isotropic virtual planes: estimators of length density and total length in thick, arbitrarily orientated sections. J Microsc., 191, pp 238-248. Mouton PR, Gokhale AM, Ward NL, West MJ., 2002 Stereological length estimation using spherical probes. J Microsc., 206, pp 54-64. Stocks EA, McArthur JC, Griffen JW, Mouton PR., 1996 An unbiased method for estimation of total epidermal nerve fibre length. J Neurocytol., 25, pp 637-44.